Build your own bent shaft canoe or paddle board (SUP) paddle. 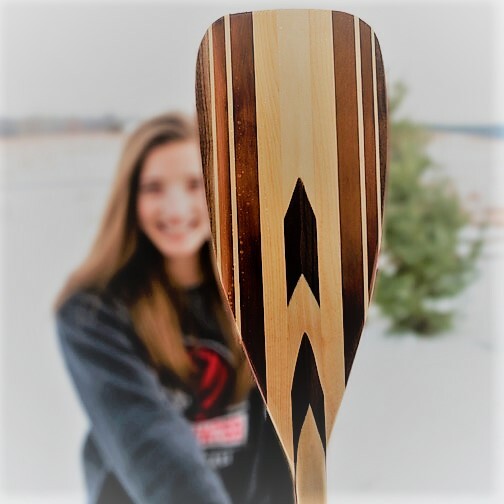 Students will learn about wood selection and grains, use of hand tools and skill saw, paddle design and considerations, and paddle sizing. Each student will leave with a completed bent shaft paddle ready for varnishing. This class will take place over 1 weekend in April with 3 different class periods for a total of 7.5 hours: Friday, April 26: 6:30pm-8:30pm, Saturday, April 27: 1pm – 4:30pm, and Sunday, April 28: 1pm-3pm. Space is extremely limited, so register early! Only 4 participants per class. 16 and 17-year-old young persons are welcome to join this class – they must register separately and be accompanied by an adult also registered for the class. Adults who are interested in bringing a young partner (minimum age 10+) can register for the second class this weekend beginning April 26 at 4 – 6pm, see class list. Students to wear clothing that can get permanently stained/damaged. Location: Marine on St. Croix, private location to be emailed to students prior to class.